A standard business-style SWOT (Strengths, Weaknesses, Opportunities, Threats) analysis has been carried out on the future prospects for the growth of Buddhism in the West. In recent years, Buddhism has been undergoing a rapid expansion in the West, especially America. But what of the future? 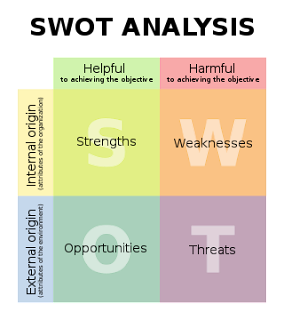 This article applies a simple SWOT business analysis to the potentials and limitations affecting the growth of Buddhism in the West. - Strengths: characteristics of the 'business' that give it an advantage over others. - Weaknesses (or Limitations): are characteristics that place the business at a disadvantage relative to others. - Opportunities: external chances to improve performance in the 'business environment'. Buddhism can be presented as an applied psychology or philosophy, as well as a religion. And we can get a lot of mileage from the first two aspects before we need to invoke religious faith. Another aspect of Buddhist diversity is that the various traditions of Buddhism coexist without mutual animosity. Among religions, Buddhism is uniquely open to examination and rationalism. Unlike most religions, which don't like their dogmas to be questioned, Buddha said that subjecting his teachings to searching critical analysis would help us understand them. 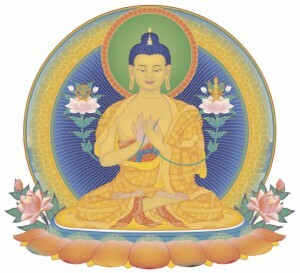 The worldview of modern science, in areas such as quantum physics, computer science and biology, has become increasingly in agreement to that of Buddhism, especially as essentialism has declined. Buddhism has no anti-rational foundational tenets such as creationism and 'young earth'. But as essentialism declines, newer philosophical approaches such as Process Philosophy are far closer to Buddhist thought than the old 'footnotes to Plato' that have dominated Western Philosophy throughout the Christian era. Buddhism is the only religion that can offer a convincing philosophical challenge to the bleak doctrine of materialism - the default 'scientism' that the mind is the product of machine-like neural activity and there is no spiritual dimension to existence. Buddhist techiques are becoming accepted in mainstream medical practice as treatments for a variety of psychological disorders. The Abrahamic religions are patriarchal and misogynistic to greater or lesser extent. Buddhism, like Paganism, honors the feminine aspect of humanity. One of the favorite devotional Buddhas is the female Buddha Tara. Only Buddhism offers solace and rituals for the death of pets. In contrast, Christianity regards animals as mindless machines whose souls do not survive death. Buddhism in the West does not have the burden of historical baggage carried by other religions (inquisition, witch hunts, Galileo, religious wars, 911, institutionalized child-abuse etc). This is not to say that Buddhism's record is spotless, but its trangressions are fewer and less well known in the West than those of the usual suspects. 1.12 Rising status of Buddhism. At a time when other religions are coming under increasing attack from the 'New Atheists' for their absurdities, illogicalities and ingrained intolerance, Buddhism is escaping unscathed. This is possibly in part to due its lack of an anthropomorphic Samsaric God (though Buddhism isn't necessarliy atheist), and in part due to its rising intellectual status, especially among the medical profession. Buddhism is sometimes perceived as being cold, intellectual and aloof. This may in part result from contrasting traditional visual representations of Buddha and Jesus. Whereas Buddha is portrayed as serene but detached, Jesus is seen interacting with people. When the Christian Church spread across pagan Europe, it did so by a process of 'transculturation', where local pagan customs were adapted rather than repressed, and given Christian significance. Hence pagan Eostre became Christian Easter, Yule became Christmas, Imbolc became Candlemas etc. Although the exocitism of Buddhism has its attractions, this should not be at the expense of Western Buddhists withdrawing from their traditional culture and festivals. Like Lisa Simpson in 'She of Little Faith', Western kids won't take to any religion that prevents them celebrating Christmas and Halloween. In the past, Buddhism has often been misrepresented by proponents of other religions, sometimes deliberately, and sometimes out of ignorance. A favorite accusation is that of idolatry. As accurate information is now available via the internet, this is becoming less of a problem. The anti-Buddhist propagandists are simply making themselves look stupid. For the usual anti-Buddhist arguments, and answers to them, see here. Buddhist Philosophy (eg Madhyamaka - The Middle Way) is seldom studied in Western university philosophy departments, and when it is studied, it is often treated as of cultural, historical or anthropological interest only. The decline of traditional religions is leaving a spiritual gap which less doctrinaire faiths can fill. 3.1.2 Collateral damage to other Abrahamic religions from Islam. 3.1.3 Decline of Catholicism due to child abuse scandals. 3.1.5 Anti-rationalism. Many evangelical Protestants have shackled themselves to a corpse in their commitment to the literal truth of Genesis and rejection of evolution. Nevertheless, although the claim to be 'spiritual but not religious' has become something of a cliche, this reflects a need for some form of spiritual nourishment as an alternative to bleak materialism. This is mostly being filled by 'New Age' spirituality, where you can pick and mix whatever beliefs and practises you like without any reference to doctrinal authority. As meditation and rebirth are popular New Age themes, bits of Buddhism usually get incorporated into the mix alongside Paganism, Celtic spirituality, crystals, geomancy etc. 3.2 Increasing the awareness of the medical benefits of Buddhist practice. Although Buddhist meditational techniques have gained orthodox medical approval to an extent unthinkable 20 years ago, there is probably still scope for expansion nere. 3.3 Increasing the awareness of the parallels of Buddhism and science. Most westerners, because of the increasingly bitter battle between evolution and creationism, assume that religion and science must always and inevitably be in conflict. There is consequently immense scope for public education in the compatiblity of Buddhism and science. The Abrahamic religions started out as Bronze Age warrior cults, and it still shows. Their attitude to women, and the feminine side of human nature in general, varies from bad to appalling. Buddhism can do more to establish its reputation as the one major religion that doesn't denigrate women. Many Lesbian, Gay, Bisexual and Transgendered people find the Abrahamic religions unwelcoming, if not downright hostile. Buddhism provides them with an object of refuge. Ever since those long ago days of hippies and flower power, Buddhism has enjoyed a certain chic status among creative and artistic people. This aspect of pop Buddhism has become more widespread in recent years, with Buddhas appearing in suburban gardens, magazine advertisements and even nightclubs. The danger of Buddha kitsch is that Buddhism will be trivialized and may even become to regarded as a quick fix for Samsara (which is, of course, ultimately unfixable). "How will Buddhism in the future find the way to make its fullest contribution towards the transformation of society? And yet how can we avoid it being absorbed and neutralized by its encounter with the contemporary world, so that it is reduced to yet another tool to numb us, conscripted and integrated into western society, to become simply an interesting offshoot of psychology, a branch of the New Age, or part of the health movement? Many of the Tibetan masters I know today have the same concerns and are asking themselves the same questions as western Buddhists, as we pass through this period of transition together. They also have concerns of their own. They see a number of warning signs for the future. When we see Buddhist images on advertising hoardings, in Hollywood films and as icons of the chic, it is a testimony to the popularity of Buddhism, which can be gratifying, even exhilaratingbut at the same time chilling. Because where will the popularity of Buddhism lead? Are we witnessing the conversion of Buddhism into a product, something which is quick and easy to master, and which ignores the patient discipline and application that is really needed on the Buddhist path, like on any other spiritual path? Then what are the dangers of trying to make Buddhism too palatable for American tastes and fashions, so that we are subtly editing or re-writing the teachings of Buddha? Is there a risk of Buddhism being sold too hard, and being too pushy, even evangelical? Commercial-style grasping seems foreign to Buddhism, where the emphasis has always been on examining ourselves. Driven by our compulsive desire for something new, what will be the long term result of seeking to put a little bit of knowledge into action too soon: rushing in too early, only in order to be productive? My feeling, and that of the masters I know, is that practicality should never take priority over the authenticity of the teachings." In attempting to impose 'scientism' and physicalist philosophical views on Buddhism, the secularizers risk throwing out all the spiritual and mystical aspects leaving an arid, spiritually-barren, materialist philosophy. This has been critiqued by Alan Wallace. Another double-edged sword is the New Age. Although some New Agers may incorporate selected Buddhist beliefs and practices into their worldview, there is a danger that authentic dharma will become diluted, garbled and corrupted by mixing with everything and anything, in multiple New Age spiritual fruit salads. Although evangelical Christianity is a major threat to Buddhism in traditionally Buddhist countries like Mongolia and Korea, it doesn't seem to be in competion with Buddhism in the West. This is probably because most Western Buddhists are people who have already abandoned their Judeo-Christian religion before developing an interest in Buddhism, and are unlikely to go back to their ancestral faiths for a variety of pre-existing reasons. Some versions of paganism, such as Wicca, are fishing in the same pool as Buddhism, in that they attract post-Christians who are looking for spirituality without the dogma, misogyny, judgementalism and homophobia that infest their ancestral religions. As regards competing for converts with Buddhism in the West, Jihadism is a non-starter. The growth of Jihadism in Europe and North America is due to immigration and massive birthrates. Conversions of westerners are mostly among dissaffected sections of society such as street gangs and jail inmates, who are attracted by the violence, machismo and promise of divine approval for predatory and anti-social activities. Conversions of 'normal' Westerners are so rare that Jihadists make a huge publicity circus whenever a prominent Westerner converts, in contrast to conversion to Buddhism, which is so commonplace it goes unremarked. Jihadism is definitely not fishing in the same pool as Buddhism. ...Coercion, intimidation, thuggery and outright terrorism are intrinsic and essential features of Jihadism. Jihadism is so intellectually moribund and ethically repulsive that it cannot compete for followersin a free marketplace of ideas, but must eliminate its competitors by whatever means may be necessary.  Why didnt the Buddhists fight back?  Are there no examples of Buddhists having taken up arms? Have they all adhered to a radical pacifism?